Sign-up using the form or call us at 801-776-4372 to make your appointment today! Welcome to Clearfield Veterinary Clinic P.C. Your Pet's Health Is Our Concern! Clearfield Veterinary Clinic P.C. has been established for nearly 30 years. In 2005, it was bought by Dr. Lara Taylor. Dr. Taylor is a licensed veterinarian in Utah, as is her father who occasionally fills in at the clinic. 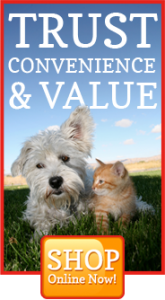 As a full service veterinary hospital, we treat small animals, birds and exotic pets. We perform general surgeries, provide orthopedic, spay/neuter, and dental services. We incorporate holistic wellness care into our general medicine as well as special diets and preventive medicine. Our office is open six days a week. We accept VISA, MasterCard, Discover, cash, checks, and Care Credit. In order for your check to be accepted, you must present your current drivers license. Please contact us today for a free phone consultation and estimate. And be sure to ask if we have any specials or promotions in effect. At Clearfield Veterinary Clinic P.C., we treat your pets like the valued family members they are.